25 December 2005 - May you and your loved ones enjoy the true meaning of Christmas and have a prosperous New Year. Let's all give thanks for what we have and pray for a more peaceful year in 2006. 21 December 2005 - Manuel Marín Carrión has released a new scenery for Los Llanos Air Base (LEAB) and the surrounding areas of Albecete, Spain. Los Llanos is the home of the 141 and 142 Sqds of the 14th Wing (Ala de Casa 14) operating the Mirage F1. The scenery, though considered a beta version, is a major upgrade to his previous versions, includes photo-realistic textures, and is a large download, 64MB, from simviation.com. 17 December 2005 - Cyril Pioffer (alias Gator) has added two videos to his website highlighting the development and features of his upcoming Mirage 2000-5. One is 24MB but will worth the download. 8 December 2005 - Cristiano Magnani has repainted the Cheetah C of Thinus Pretorious as a Mirage IIIEBR (F-103) of the Força Aérea Brasileira (FAB). The aircraft are finished as No. 4931 based at Anápolis Air Base and in the 30 Years Anniversary scheme. There are also no installation instructions. If you need assistance please read this article from Flightsim.com. Udo Entenmann has repainted the FS98/CFS2 Mirage IIIB of Alpha Simulations in the colors of the United Arab Emirates Air Force. The aircraft represents 2nd "Shaheen" Squadron, Al Dhafra Air Base, Abu Dhabi. Michael Pearson has completed 7 new Mirage 2000N aircraft in Armée de l´Air colors. These are textures only so you will need to install either of the two Mirage 2000N's by Roland Laborie first. There are also no installation instructions. Here is the list of the aircraft with download links to the avsim.com library. 1 Decemeber 2005 - Thinus Pretorius has finished his new SAAF Cheetah C. This aircraft is based on his earlier Mirage IIIEZ and Cheetah E and features a working VC, a new instrument panel, and sounds. The instruments and many of the animated features of the aircraft (drag chute, drop tanks, etc.) are from the Mirage F1 project he worked on with Vasco Ferreira. The aircraft is available at Avsim.com and Simviation.com. 26 November 2005 - Peter Dooley wrote to say that he and his brother David have completed an upgrade for their Mirage F1CZ panel and flight model package. By special arrangement with Kirk Olsson the new package includes Kirk's new Mirage F1C aircraft to replace the original model by Vasco Ferreira. Also included is a new set of textures by Jens-Ole Kølberg representing F1CZ No. 206 flown by Arthur Piercy. Peter tells me that they have also released a free panel upgrade for their Mirage aircraft including a more realistic looking 3D panel background, radio stack, etc. 23 November 2005 - The people have spoken. Congratulations to Kirk Olsson for being voted to receive the Flightsim.com Developer's Award for his outstanding Mirage F1. 17 November 2005 - At my request Kirk has also made a Mirage F1C-200. The F1C-200 is a new single aircraft using the default FS sound files to reduce file size. The aircraft is available at Avsim.com and Simviation.com. 11 November 2005 - Jens-Ole Kjølberg has painted up a version of the Mirage F1CZ in South Africa Air Force colors. This aircraft represents No. 203 from No. 3 Sqd in the "Le Spectre" air superiority color scheme. 7 November 2005 - Olliver Rodrigues has repainted the Mirage IIIE of Thinus Pretorious as a Mirage IIIEBR (F-103) of the Força Aérea Brasileira (FAB). The aircraft is finished as No. 4927 based at Anápolis Air Base. There are also no installation instructions. If you need assistance please read this article from Flightsim.com. 5 November 2005 - Kirk Olsson has been reading the forums and in response has decided to remake the MDL files for his new Mirage F1 set to have fewer VC parts (reducing the [vcockpit] sections from 26 to 3). This will improve the gauge refresh rate in this view to reduce the "lag" in updating of the gauges. As a result, there is a drop in frame rates by about 10 fps in tests. The 12MB "Patch" is available at Avsim.com and Simviation.com. 2 November 2005 - Jens-Ole Kjølberg has painted up another version of the Mirage F1AZ in South Africa Air Force colors. This aircraft represents No. 247 from No. 1 Sqd in the final three-tone color scheme of the 1990s. Michel Merle sent a small set of new textures for the Mirage IV texture pack that he painted earlier in the year. The textures are for the airbrake surfaces and will correct the color to match the surrounding camouflage. 30 October 2005 - Manuel Marín Carrión has released his own set of replacement textures for the Mirage F1 by Kirk Olsson. This aircraft is also an overall gray F1M of Ala de Casa 14, Ejercito d'Aire Español located at Los Llanos AB. 24 October 2005 - Contrary to false rumors that he had abandoned his Mirage 2000 project, Cyril (Gator) Pioffet is indeed working on the aircraft and hopes to have it completed by the end of the year. To illustrate the recent progress he has posted images in the Forum at Francesim.com and on his own website. 19 October 2005 - Michel Merle has released a third "pack" of repaints for the new Mirage F1 by Kirk Olsson. This set includes four F1CT with EC 1/30 "Alsace" based at Reims-Champagne AB (LFSR), four aircraft with EC 3/33 "Lorraine" based at Colmar-Meyenheim AB (LFSC), and a single aircraft with EC 5/330 "Côte d'Argent" based with the CEAM at Mont-de-Marsan AB (LFBM). Michel has also updated his previous two "packs" with more markings details and additional aircraft. 17 October 2005 - Michael Pearson has been working on repaints of the Mirage 2000 by Roland Laborie. He has completed 31 new aircraft in Armée de l´Air and export customer colors. These are textures only so you will need to install either of the two Mirage 2000N's by Roland first. There are also no installation instructions. If you need assistance please read this article from Flightsim.com. Here is the list of the aircraft with download links. 13 October 2005 - Michel Merle of the Aéro-Passion association has completed two well researched sets of textures for the new Mirage F1 by Kirk Olsson. The first set includes six new texture sets for the Mirage F1CR in the markings of ER 1/33 "Belfort" and ER 2/33 "Savoie" based at Reims-Champagne AB (LFSR). The second set includes four new texture sets for the Mirage F1CT in the markings of EC 2/30 "Normandie-Niemen" based at Colmar-Meyenheim AB (LFSC). 10 October 2005 - Jens-Ole Kjølberg has released the first set of textures for the new Mirage F1 by Kirk Olsson. Actually these were completed a while ago since Kirk used Jens-Ole's textures as a starting point. The aircraft represented is a No.1 Sqn Mirage F1AZ of the South African Air Force in the original delivery camouflage colors. This particular aircraft was damaged but not lost during combat operations over Angola in 1980. 8 October 2005 - The wait is over. It is finally available for all to enjoy. Kirk Olsson has finished his Mirage F1 v2.5 update. Included in this release are the F1C, F1AZ, F1CR, and F1CT. Various weapons loads are included, weathered textures, an improved flight model thanks to imput from real "tifin" pilots, and a very fun to fly 2D panel and Virtual Cockpit. 7 October 2005 - Giannis Sabranis of Greece has repainted the original Mirage 2000 by Roland as a Mirage 2000EG in a scheme with the Greek flag on the tail. The new Mirage 2000N by Roland Laborie is now available for download from avsim.com. This is the 64MB version (without arms) with accurate flight model, active virtual cockpit, new specific HUD, and more. The package includes four different textures and an illustrated documentation file (in French). 2 October 2005 - Philippe Gillet of the French Air Force (Virtual) website wrote to announce that the new Mirage 2000N from Roland Laborie is now available. Two versions of the package are offered, "smooth" and "armed". A list of included textures and screenshots are available in the Forum at Francesim.com. Both packages are large downloads, 21MB and 65MB, so a small fee is being charged to help defray the bandwidth usage fees. You can review the features and development of this new version in another thread at the Francesim.com Forum.  Only 60% of FS users use the flaps. They must be flying a delta wing Mirage.  Very few people use the Virtual Cockpit.  After the default Cessna and Boeings, most people fly 3rd party addon aircraft.  Get involved with the FS community through user Forums.  The upgrade path for your equipment should be 1) Video Card, 2) RAM, and 3) CPU. Some big features they are working on that we were shown were all related to the new graphics technologies built into the newest video cards: material reflection, shaders and environmental reflection, bloom, and Bump Mapping for textures. 11 September 2005 - Never Forget! The September 11 Digital Archive uses electronic media to collect, preserve, and present the history of the September 11, 2001 attacks in New York, Virginia, and Pennsylvania and the public responses to them. 10 September 2005 - We're getting closer! Kirk Olsson sent an email this week with new screen shots of his Gmax Mirage F1. He has changed the textures to have a more photo-realistic appearance, changed the weapons loads from the FS2002 release, added engine shut down visual features, and added new versions: an Armée de l'Air F1CT and an SAAF F1AZ!!! We're not waiting for my 2D instrument panel anymore (that will follow later) so the release will be very soon. I have added some of the new screen shots to the Preview page. Peter and David Dooley, creators of the Mirage F1CZ instrument panel and flight model, have recently added an ATC Procedures page to their website which contains all the latest phraseology in air traffic control. This is also used in the military but with some obvious extras during certain operations. They are pleased to be able to share this kind of useful information and therefore enhance the overall simulation realism. 6 September 2005 - This is not really a Mirage F1 and it is not really a Pakistani Air Force JF-17 Thunder either. But the latter is scheduled to begin replacing the large variety of Mirage III and Mirage 5 operated by the PAF as early as 2006. In honor of Pakistan's Defense Day (September 6) Umair Ayaz has modified the textures of Jens-Ole Kjølberg on the FS2000 Mirage F1 of Kirk Olsson. You will be prompted with a question the first time you fly this aircraft in FS2004 so please read my notes from 18 November 2004 or the Conversion Notes page. 29 August 2005 - There is a nice review of the Mirage IIIEZ by Thinus Pretorius in the online ezine South African Virtual Pilot. Recently the Corse VFR scenery by Alexandre Cadel and Jean-Louis Vau was updated to revision 5a. The Corse VFR scenery and the airports (including Solenzara AB) of Christian Santoni are compatible with Project "LandCorse". Project "LandCorse" is the effort of the original designer "HotShot" to redefine the coastline of the “Ile de Beauté” (Corsica). You can read (in French language) more about this project in the Project LandCorse thread at Francesim.com. 19 August 2005 - The Mirage IIIO of Warwick Carter has been updated. Warwick has worked on several areas including the flight model and has allowed me to assist with the weapons configuration. This version is armed with new underwing tanks and Matra Magic missiles on cranked launch rails. A new commemorative texture is also provided by Garry Smith. 12 August 2005 - Thinus Pretorius has finished his new Cheetah E. This aircraft (like the real one) is based on his earlier Mirage IIIEZ and features a working VC and new instrument panel. The instruments and many of the animated features of the aircraft (drag chute, drop tanks, etc.) are from the Mirage F1 project he worked on with Vasco Ferreira. 7 August 2005 - Michel Merle, of Aéro-Passion and who repainted the Super Entendard by Romain Lucas and the Mirage IV by David Bushell/ Alpha Simulations, sent a message to let me know that new versions of the MDL file for the Super Etendard and the Rafale are available for use with IBNET. I have used them both and there is no negative affect to using the adjusted MDL files without IBNET. IBNET is a "must have" program for flying with others pilots. You can see all smoke effects (acrobatic team smoke, water drops from fire bombers, etc. ), light effects, aircraft animation (opening of the canopy, airbrakes, etc. ), and more soon including sounds of other aircraft. The program is available to the public but still under development. Here are a few screenshots taken during an IBNET session over Corsica in the SEM. 3 August 2005 - The Mirage III of Warwick Carter has been given a new texture set. Cristiano Magnani has repainted it in the 30 Years Anniversary scheme applied to a Mirage IIIEBR of the Fuerza Aérea Brasileña (FAB). 30 July 2005 - Jens-Ole Kjølberg has released another in his series of Mirage III aircraft updated for FS2004. As with his previous installment in SAAF markings (see 24 June) Jens-Ole has applied a very convincing bare metal finish. This new set features textures for two Israeli "ace" Mirage IIICJ aircraft. The series is based on the Mirage IIIC by Jason Ashworth. Jens-Ole has also added a new afterburner effect and created a new panel. 23 July 2005 - Bernard Gosset (alias Papy31) has updated his VFR scenery for Liège-Bierset (EBLG) in Belgium. Screenshots and more information is available at Bernard's website. The scenery is available for download exclusively from Libertysim.net. 7 July 2005 - Oliver Gerbers has enhanced his afterburner add-on (ver. 3) for the Mirage F1CZ instrument panel and flight model to include simulated cannon fire. Screenshots and the download are available on the Free Downloads page of the website. Be sure to also check out their Fixes page as well. As always, make a backup of your original files before installing any add-on packages. Roland Laborie continues to develop his Mirage 2000 with several enhancements. These include new schemes (desert and anniversary), realistic crew ejection simulation, cannon fire, flying Matra Magic missiles, and flying AS-30 missile. These improvements are not available yet but you can read all about them (in French) and view screen shots at the Francesim.com Forum. 28 June 2005 - There is a new Mirage IIIEZ in the FS2004 skies thanks to Thinus Pretorius of South Africa. Thinus has provided several Mirage instrument panels and aircraft over the years as well as participating in the recent Mirage F1 instrument panel and flight model project. His latest release is an original design and captures the shape of the Mirage III very well. The aircraft is painted up in the scheme flown by Major Arthur Piercy with No. 2 "Cheetah" Squadron markings and includes a new instrument panel as well. 24 June 2005 - Jens-Ole Kjølberg has released his second South Africa Air Force Mirage IIICZ based on the original by Jason Ashworth. This one is finished in the initial bare metal scheme worn by the aircraft after delivery in 1963. Also included is the new instrument panel Jens-Ole designed and included in his previous Mirage III update for FS2004. 22 June 2005 - Michel Merle of the Aéro-Passion association has finished several new textures for the Mirage IV from Alpha Simulations. This Pack 1 includes 10 texture sets for ERS 1/91 "Gascogne" at Mont-de-Marsan AB (LFBM). Michel also has plans for a second "Pack" of Mirage IV textures covering special occasion schemes. 19 June 2005 - Now that everyone has had time to master the Mirage F1CZ instrument panel and flight model how about a couple of intercept missions? A new add-on package provides two missions (dawn and dusk flights) against a flight of intruders. Success requires split second timing and precision navigation. Also, the Dooley brothers are listening to the compliments and criticisms of their Mirage F1 project. Visit their website for more information. 18 June 2005 - Michel Merle of the Aéro-Passion association has finished Pack 2 of his series of textures for the Super Etendard Modernisé by Romain Lucas. The set of textures includes 13 aircraft assigned to Flotille 17F based at BAN Landivisiau and on board the carrier Charles de Gaulle (R-91). Pack 1 featured aircraft assigned to Flotille 11F. 16 June 2005 - Jens-Ole Kjølberg has finished his first FS2004 update for the Mirage IIIC of Jason Ashworth. This first aircraft is a previously unreleased visual model armed with supersonic tanks and Kukri missiles and wears a low-visibility scheme. Jens-Ole has also included a new instrument panel. 12 June 2005 - Bob Chicilo has updated the Mirage 4000 of Romain Lucas. The update includes new air and aircraft.cfg files as well as adding afterburner and smoke effects. The update assumes you have already installed some of Bob's previous fighter aircraft updates. Search the avsim library or simviation.com for files mentioned in the Readme file. 8 June 2005 - Peter Dooley wrote to say that they had posted a freeware upgrade by Oliver Gerbers. This upgrade to their Mirage F1CZ instrument panel and flight model adds new flame/reheat effects (with and without smoke) to the afterburner and corrects the frequency dialing for NAV1 and 2. Peter added that they are inviting anyone who wishes to make similar contributions / tributes to the Mirage F1CZ project to submit them for posting. The downloads could be anything that will further create a positive awareness of Mirage aircraft and the project. They have also posted a letter sent by Arthur Piercy about the aircraft and the accuracy of the product. 5 June 2005 - Jens-Ole Kjølberg is breathing new life into the FS2002 Mirage IIIC of Jason Ashworth. Starting with a previously unreleased visual model armed with supersonic tanks and Kukri missiles, Jens-Ole has painted up a new low-visibility scheme and bare metal schemes for the South Africa Air Force and the Israel Air Force. The aircraft and a new instrument panel will be available soon. Details are available here. 3 June 2005 - Marc Hardouin has painted up two early Dassault fighters in the colors of the French Aerobatic Demonstration team Patrouille de France. The aircraft represented are his own Mystere IVA and the Dassault Ouragan of Thinus Pretorius. And Thinus Pretorius, who has made several instrument panels over the years and most recently made a Dassault Ouragan, is now working on a new Gmax Mirage IIIEZ for FS2004. 31 May 2005 - Michael Pearson has again applied his virtual airbrush to the gmax Mirage 2000N of Roland Laborie. This group includes one Indian Air Force Mirage 2000TH and seven Armée de l´Air versions. These are textures only so you will need to install the Mirage 2000N of Roland Laborie first. There are also no installation instructions. If you need assistance please read this article from Flightsim.com. Here is the list of the aircraft with download links. 27 May 2005 - Michel Merle of the Aéro-Passion association is working on a series of textures for the Super Etendard by Romain Lucas. Pack 1 is now available and includes textures six aircraft assigned to Flotille 11F based at BAN Landivisiau and on board the carrier Charles de Gaulle (R-91). Pack 2 will feature aircraft assigned to Flotille 17F. 22 May 2005 - Bob Chicilo has updated the Super Mystere B2 of Wim Regeer. The update includes new air and aircraft.cfg files as well as adding afterburner and smoke effects. The update assumes you have already installed some of Bob's previous fighter aircraft updates. Search the avsim library or simviation.com for files mentioned in the Readme file. 16 May 2005 - The new Mirage F1CZ instrument panel and flight model has been released at the Mirage F1 Cockpit Simulator website. It is a 25MB download. The registration process for the Mirage F1-CZ 206 Project is being handled via the Flight1 wrapper system. The aircraft included is based on the Mirage F1 by Vasco Ferreira. There are two versions: armed and clean. Thinus Pretorius, who has also made several Mirage contributions, was also involved in the project. 10 May 2005 - Peter Dooley wrote to say that they are getting close to release of their payware F1CZ instrument panel and "ultra-realistic" flight model. The package will be priced at $15.00. There is a lot of information on their website that you can read. Peter commented in his email, "As you know, most of our effort has been directed into the aerodynamic model and cockpit so you will find her a pleasure to fly. There are also a few surprises for some flight sim pilots that tend to fly fast aircraft and use the flaps as air brakes or ignore the after-burner or engine management schedules or who think that they can simply ignite the after-burner and suddenly fly supersonic at 36,000 feet as if it is some kind of miracle button." He added, "The big surprise will come when they try to fly supersonic at low level from outside the cockpit for more than 15 minutes without checking their fuel gauge. We have got our fuel flows to work correctly and as you know, this aircraft uses over 300 liters per minute flying supersonic at sea level. I am sure you will enjoy all of these little realities." 8 May 2005 - With a package as large as the French Military AI package there are bound to questions for setting it all up. The author, Christian Muenier, has started an FAQ page to address common questions. 6 May 2005 - Christian Muenier has finished a new French Military AI package. You can read about it and see screenshots during development in this thread at flightsimmer.com. The package features French Armée de l'Air (Air Force), Aéronavale (Navy), Aviation Légère de l'Armée de Terre (Army), Sécurité Civile, and Gendarmerie (Military Police) aircraft. There are AFCAD files for all bases involved, flightplans for AI, and 30 adventures. Obviously many different Mirage aircraft are present including those painted by Michael Pearson (see the lists under 12 February and 23 March below). In addition to the types flown by the modern Armée de l'Air, the Mirage III is represented by a special AI version (low poly count) from Warwick Carter. The AI package is just over 40MB in size. 21 April 2005 - Franco Carluccio has repainted the textures of the Mirage III by Warwick Carter in a two-tone sand and brown scheme with Fuerza Aérea Argentina insignia, similar to the Mirage IIICJ's operated by Argentina. These are textures only so you will need to install the Mirage III of Warwick Carter first. There are also no installation instructions. If you need assistance please read this article from Flightsim.com. 19 April 2005 - It has been a slow month for new aircraft or repaints. But there has been new scenery. Alexandre Cadel and Jean-Louis Vau have released revision 5 of the Corse VFR scenery. This is a complete package so be sure to remove any previous versions. You can read (in French language) more about it in the Project LandCorse thread at Francesim.com. This is a nice complement to the the "mesh" sceneries of either Thierry Pignot or Nanucq. 5 April 2005 - Kostis Prassas put together a Hellenic Armed Forces AI Package. Among the 31 aircraft and flightplans included are the Mirage 2000 based on the gmax version of Roland Laborie. Also included at AFCAD2 files for 27 Greek air bases and air fields. Two updates have been quickly added to correct missing elements and add the new 2000BG of Roland Laborie. The main package is 24MB and can be downloaded from avsim.com. 30 March 2005 - Only a few days after Roland Laborie released his Mirage 2000N, Michael Pearson had repainted it in two new schemes. Included are a United Arab Emerites Mirage 2000DAD and a Mirage 2000BG of the Hellenic Air Force. Michael has also painted a Mirage 2000RAD reconnaissance version in Abu Dhabi colors for use with the Mirage 2000C by Roland Laborie. Byron Farrow has put together a series of flight plans for operations of the Mirage 2000 by the United Arab Emirates Air Force. The suggested aircraft is the Mirage 2000 by Roland Laborie with Mirage 2000EAD textures by Michael Pearson. You'll need TrafficTools by Lee Swordy to use these files. 23 March 2005 - Michael Pearson has created several new texture sets for the Mirage F1 of Vasco Ferreira. Included are six Armée de l´Air versions and another six in export customer colors intended for use with AI Traffic projects. These are textures only so you will need to install the Mirage F1 of Vasco Ferreira first. There are also no installation instructions. If you need assistance please read this article from Flightsim.com. Here is the list of the aircraft with download links. Armée de l´Air F1CR, EC 01.033 "Belfort"
Armée de l´Air F1CR, EC 02.033 "Savoie"
Armée de l´Air F1CT, EC 01.030 "Normandie-Niémen"
Armée de l´Air F1CT, EC 02.030 "Alsace"
17 March 2005 - Roland Laborie (alias Rollus13) has completed his Mirage 2000N. The aircraft is nicely rendered and the package includes a complete panel and virtual cockpit featuring new gauges designed by Roland. The textures represent an Armée de l'Air aircraft from EC 2/4 "La Fayette" and the aircraft carries the ASMP stand-off nuclear missile. Here is a review article and an ongoing discussion during development. Both are in French language from Francesim.com. 16 March 2005 - Thinus Pretorius built a Dassault MD.450 Ouragan for FS2004 using Gmax. The aircraft includes a panel and virtual cockpit. The textures represent an aircraft from EC 2/4 "La Fayette". The Ouragan was flown by France, India, Israel, and later El Salvador, so there are many repaint opportunities. 14 March 2005 - Some sad news today. After over two years on the internet Alain has decided to close down his L'Escadrille website. Bons vols Alain. 11 March 2005 - Jens-Ole Kjølberg continues to refine his painting skills and has revisited the Cheetah C by Jason Ashworth with four revised schemes. Although the aircraft was designed for FS2002 it can still be flown in FS2004 with no flight problems or lack of control surface/landing gear animation. Please refer to my Conversion Notes or the What's New entry for 18 November 2004 for instructions. 7 March 2005 - Y.Raymond has sent another set of textures for the Rafale C by Cyril Pioffet. This set includes two versions of the all black Rafale C01; with and without a large Rafale logo on the tail. As with his earlier versions only the textures are included so you will need to install the complete aircraft first. Please see my notes for 21 February below. Derek Wakefield has "backward" converted the textures from the original FS2000 Kfir C2 and Mirage IVP by Alpha Simulations to correct display problems found in FS98. 3 March 2005 - Y.Raymond sent a new set of textures for the Rafale C by Cyril Pioffet. These represent a camouflaged aircraft and wear the tail markings of Armée de l'Air Escadron de Chasse 1/2 "Cigognes" at Dijon AB. Contrary to tradition EC 1/2 will not fly the Rafale but this version does look convincing. As with his earlier repaint for the Rafale M the package includes only the new textures. Please see my notes for 21 February below. 1 March 2005 - Peter and David Dooley of Mirage F1CZ cockpit simulator fame (also recently mentioned on the avsim.com website) have updated their RPM gauge for the Mirage F1/SNECMA Atar 9K-50 so that it can now be installed into the instrument panel of ANY turbo jet engined aircraft. The fuel flow readout now has a six-digit display (not limited to 9999 RPM only as before) so it can be used with the Mirage IIIE/5 Atar 9C engine at 12,000 RPM or other faster spinning engines. The XML and bitmap files are also included in case any instrument panel designers want to modify it for another aircraft. 28 February 2005 - Mike Pearson has released an update to correct his original 18 Armée de l´Air Mirage 2000 repaints (see 12 February below). The update reduces the variety of camouflage colors to the correct two, corrects the inaccurate use of the same SPA insignia on both sides the tail, and corrects a problem with the aircraft number display. Mike has also painted one more version of the Mirage 2000C by Roland Laborie in a desert camouflage scheme similar to that applied during Operation Daguet (Desert Storm/Shield). 21 February 2005 - Y.Raymond has painted the Rafale M by Cyril (Gator) Pioffet in the markings of Aéronavale Francaise, Flotille 12F, aircraft n°5. The package includes only the new textures files so if you haven't already installed this outstanding aircraft you will need the aircraft/panel file, the separate gauges and sound files, as well as the updates: Rafale M, afterburner effects, and the FS2004 panel fix by Siegfried Vlaminck. 12 February 2005 - Michael Pearson has been working on repaints of the Mirage 2000C by Roland Laborie. He has completed 25 new aircraft in Armée de l´Air and export customer colors. These are textures only so you will need to install either of the two Mirage 2000C's by Roland Laborie first. There are also no installation instructions. If you need assistance please read this article from Flightsim.com. Here is the list of the aircraft with download links to the avsim.com library. For Armée de l´Air versions also download the update. 11 February 2005 - Cyril "Gator" Pioffet has revealed more details of the navigation system, HUD, and instrument panel display screens in the forum at Francesim.com. Cyril has also included a description and new images on the "News" page of his website. Microsoft South Africa has mentioned the Mirage F1CZ cockpit simulator website of Peter and David Dooley in the latest issue of the Insider Update Newsletter. Peter and David have also updated the Mirage F1CZ Flight Manual page. 9 February 2005 - Marc Hardouin has repainted the Dassault Mystère IVA of J.R. Lucariny in Armée de l'Air markings. The unit represented in the bare metal scheme is the operational conversion unit ETO (Escadron de Transformation Operationnelle) 02/08 "Nice" from the period 1975. 5 February 2005 - Alexandre Cadel has released version 4 of his Corsica VFR scenery add-on. The new version also includes scenery elements from the original Project LandCorse by "Hotshot" from the Forum at Francesim.com. As before this release includes villages and other VFR references and is a nice complement to the the "mesh" sceneries of either Thierry Pignot or Nanucq. Be sure to remove any previous version before installing this new one. 30 January 2005 - Christian Muenier of Réunion Island recently released an FS2004 AI Traffic package for the Egyptian Air Force. Among the 34 different aircraft included in the package are repaints of the Mirage III by Warwick Carter (two versions: desert camouflage and overall gray) and an overall gray version of the Mirage 2000 by Roland Laborie. The package also includes scenery AFCAD files and AI traffic files. 24 January 2005 - J.R. Lucariny, from Brazil, has released a new Dassault Mystère IVA. The aircraft is finished in Israel Defence Force - Air Force camouflage markings. The Mystère IV began service with Israel in 1956 and the type was in IAF service until the end of 1967 Six Day War. They flew both air-to-air and ground attack missions and are credited with downing 9 enemy aircraft. 14 January 2005 - Earlier this month I invited you to visit the Mirage F1CZ cockpit simulator of Peter and David Dooley. Since that time they have created a new RPM gauge specifically for the Mirage F1/SNECMA Atar 9K-50. They have also made available a Mirage F1 Flight Manual. Both of these can be found on their website, which by the way was recently recognized on the Dassault Passions webpage at Dassault Aviation. 9 January 2005 - I've been asked to post a new Salon de Provence scenery but have so far not had any luck finding one. If anyone knows of a newer version (FS2002/FS2004) During my search I did find a new Strasbourg-Entzheim (LFST) for FS2004. Although now a civilian airport, Strasbourg-Entzheim (BA 124) was once a very busy Armée de l'Air airbase for Mirage IIIR/RD and F1CR aircraft of the 33rd Reconnaissance Wing. It is a very well made scenery and includes many VFR references in the surrounding area. 6 January 2005 - When I was at the Avsim Conference in Denver last September the big topic was cockpit simulators. That's understandable since one of the benefits of attending was the opportunity to fly in a full motion, Level-D airliner simulator. Anyone involved in this more realistic alternative to Flight Simulator is aware of how rewarding it can be. 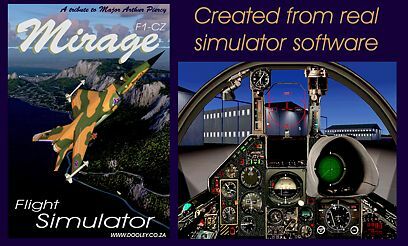 If cockpit simulators interest you then I invite you to visit the website of Peter and David Dooley of South Africa. They have built a Mirage F1 cockpit simulator using the front fuselage of a special F1CZ. 1 January 2005 - Happy New Year! I'm a little late with this but I have finally posted the annual "Year in Review" report. I have also updated the left side menu to also work with Netscape and Mozilla browsers.